I never knew that there was a whole chapter in the Koran devoted to the life of Mary, mother of Jesus. A fascinating article in this month’s National Geographic titled “Mary: The Most Powerful Woman in the World” explores the myriad of ways in which the mother of all mothers is a powerful force for healing and connection to god for millions of people—and not just Christians. Literally millions make pilgrimages each year to Lourdes/France, Mexico City, Minya/Egypt and many other places to show their devotion and gratitude to the Divine Mother. Many pray for miracles—manifesting in the physical and spiritual healings that can follow these visits. Extraordinary. Yet I suspect there are many more ordinary encounters with Mary that quietly bring peace and hope to the hearts of those so touched. Not having had a Mary siting or felt her particular presence warm my heart, I would love to explore this sacred relationship that blesses so many people. Michael O’Neill, on his website Miracle Hunter, has systematically tracked all known miracles attributed to Mary, including 2,500 apparitions since 40 A.D. These take place all over the world. Wowza! I am going to start a series called Queen of Peace, where people who have a special connection to Mary can share their experiences of her amazing grace. I’m going to start by interviewing some of my friends and family who are Virgin Mother devotees to learn about how this bond inspires their daily lives. 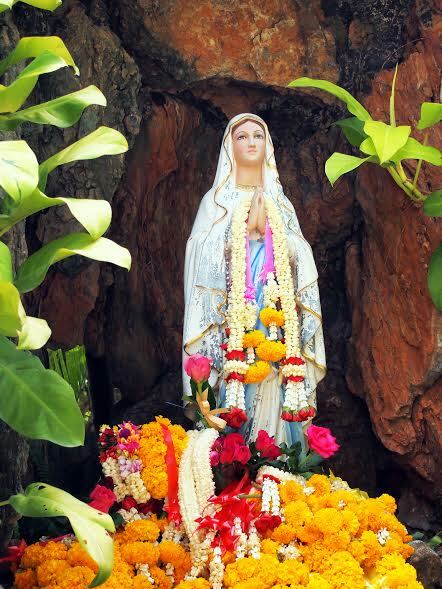 If you have a special relationship with Mary that informs your day and guides your actions, please share your experience with us on our contact ♥ contribute page.